Seraphina is all athleticism and muscle, a testament to long hours spent honing her physical form to a knife’s edge; she isn’t particularly large or bulky, but there is a good deal of power present in her frame. Her height is largely a testament to her father, as her mother, a mutt of Andalusian, Lusitano, and Sorraia heritage, stood almost a full hand shorter than her daughter, though her build – relatively light and warlike – reflects both of her parents somewhat evenly. Seraphina’s movements are disciplined and restrained, and she appears hyperaware of her surroundings at all times; she is very rarely, if ever, genuinely relaxed. There isn’t anything lovely or feminine about her, though the effort it likely requires to maintain and prime her physique is certainly admirable. She is draped in thick shades of mousy grey that slowly transitions to an inky charcoal down her legs and up her neck. A thin, shadowy dorsal stripe of the same charcoal hue runs the length of her spine, and primitive markings run most of the length of each of her legs; however, rather than the black that might be expected, these stripes are snow white. These stripes are also present along her neck, coming to a halt at the base of her skull, save for a set of white stripes that run from the back of her ears to curve in towards the middle of her face. More startling are her eyes. Seraphina is heterochromatic, and her eyes contrast each other rather sharply, with the left an icy, pale blue and the right a violent, bright yellow. Each eye is lined in thick, lengthy white lashes, further setting them apart from the general duskiness of her face. Seraphina’s mane and tail are both straight as an arrow and silky smooth. 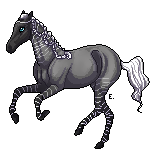 While her tail falls loose and natural, though not particularly long, her mane is pulled into a mess of braids to accommodate the silver collar around her throat and her active lifestyle. 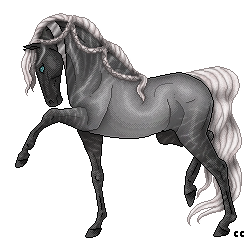 While her mane is rarely, if ever, let loose, it is quite long when allowed to flow free; her white tresses fall mid-way down her legs. Seraphina’s voice, though largely devoid of emotion, is low and silky, and it adheres well to song; on rare occasion, she can be found humming. MECHANICAL, frigid, listless – Seraphina is an apathetic and imposing figure, the carefully-crafted product of years of conditioning and manipulation. She is not kind, nor merciful, nor heroic, but she is just above all other things, to the extent that the laws she follows are just. To understand her, one must first understand that Seraphina’s morality is defined strictly by the laws that she is told to follow and enforce; she lacks any personal opinion, mercy, or, most damningly, doubt. Appeals to compassion or moral righteousness will garner no sympathy from her, because she has no comprehension of right or wrong. If it is lawful, it is correct, and if it is not, then it is incorrect. She does not have motivations or obligations beyond fulfilling her duty, and, should her duty call for brutality, so be it. She will follow her orders without question or contemplation, regardless of what they might be. Seraphina does not get any joy from her work, nor does she consider it particularly rewarding or fulfilling. She does what she is told to do because she knows - knows - that it is what she is supposed to do, and she does it well. Independence is a foreign concept. It is perhaps because she lacks any true devotion to the spirit of the laws that she so stringently adheres to that Seraphina is virtually unflappable. She is never angry, never frightened, never miserable – and, consequentially, never excited, never happy, never satisfied. It is nearly impossible to get under her skin or provoke her, and she regards most everything and everyone with a distinct and scientific apathy and coldness. For her polite, businesslike, and well-read – if blunt – manner of speaking, Seraphina is distinctly unnerving. She does not have a visible range of emotion, features retaining a stiff neutrality at all times, and her voice never changes in tone or volume, regardless of what she might be saying. She does, however, have an exceptional talent for picking apart the emotional states of others, though she has notable difficulties understanding what they mean. Her own neutrality might seem like a defense mechanism, a way of keeping her distance from others, or a battlefield tactic to gain the upper hand over a potential opponent, but, in truth, Seraphina has not felt much of anything in a very, very long time. She recognizes her shallow range of affect, of course, but she has no interest in changing it, nor would she know how to proceed. She is lawful. She is just. She is righteous. - Due to her conditioning, Seraphina will panic if the collar around her throat is touched; this doesn't work in battle, where she is already tense and hyper-aware of her surroundings, however. - She has a very slight soft spot for children, probably due to her own troubled childhood. - She has an excellent singing voice; she knows some songs in the language of Novus, but most are passed down from Viceroy, and, therefore, in his native tongue. She doesn't know what they mean. - Seraphina has an excellent memory, particularly for languages -both written and spoken- and locations. She does not, however, have strong recall of events in her own life, largely due to Viceroy's interference. Her memories are "shattered." - She has a certain scholarly streak and knows a good deal about history and folklore in particular. Seraphina was born in the Day Court, the daughter of a pretty, if vapid, young herbalist named Angelie with the bad habit of finding adventure in all the wrong places. She was young when Angelie died, and she only remembers the very last time she saw her. Mid-summer, midday, so hot and dry in the middle of the desert that it scraped her throat; she’d stumbled around her mother’s legs, enjoying how her hooves skittered and gleamed in the sand. All too suddenly, she was being shoved away in a messy tangle of limbs, her mother jerking and tossing like a butterfly caught in a hurricane, screaming at her daughter to run. Seraphina had been too scared to think about what any of it meant, so she’d listened to her mother without a second thought, dashing senselessly, fumbling in the dunes without any direction or purpose. She only remembers that it hurt, that her heart throbbed against the walls of her chest like it was trying to wrench itself free, that her lungs and her throat felt so dry and sore that her mouth tasted like blood. Eventually she gave out, sweaty limbs fumbling and depositing her small, awkward body in a heap beneath the skeletal remains of a tree. Seraphina stayed among the roots for what felt like a very long time. As luck would have it, a group of soldiers on patrol happened upon the filly, dehydrated and exhausted. The leader of the patrol, Viceroy, was the Warden of the Day Court and the brutal executioner of King Zolin; he was the first to find her, and she still remembers looking up at him, a snow-white and bizarre creature with a wreath of flames encircling his skull and great, red-tinted wings. In the midst of a violent war with Denocte that demanded more soldiers by the day, the Court came to use its children. The orphan child was no different – for her fortitude, however, Viceroy took a particular interest in Seraphina, and he raised her on the battlefield as his experiment and protégé, the first test of all his vicious methods. It was brainwashing, and some part of her probably knows it, albeit a part of her buried so far beneath the surface that she wouldn’t recognize it herself. Day after day the morality and righteousness of her court and its laws were drilled into her head, the might of Solis, the greatness and glory of their society – disagreement was punished, sometimes with humiliation, sometimes with poison and intoxicants, and other times with violence. She quickly learned to avoid dissent, and she learned to believe what she was told, if only because Viceroy’s magic allowed him to invade her mind. If he disliked its contents, he would rip it to shreds. The process was excruciatingly painful, as though her skull were being split open and shattered, and, in the beginning, it would leave the girl curled up in a ball for days. Seraphina learned to cope with his methods, and she became invested in the mentality that she had been force-fed, developing into the mechanical and lawful soldier that she is today. Viceroy was nothing if not a capable soldier, and his rigorous training molded his protégé into a meticulous, cautious warrior in her own right, capable and tactical beyond her years – her mercilessness and mindless devotion to orders became a virtue in their own right. Disobedience was beaten out of her, and discipline and fortitude settled in its place. The law of the Day Court and whoever ruled it became her morality, her guiding force. On the battlefield, facing death with each passing day and finding no love among her comrades, she grew cold and impassive. It was pure luck that they were at the capitol on the night of Zolin’s death. 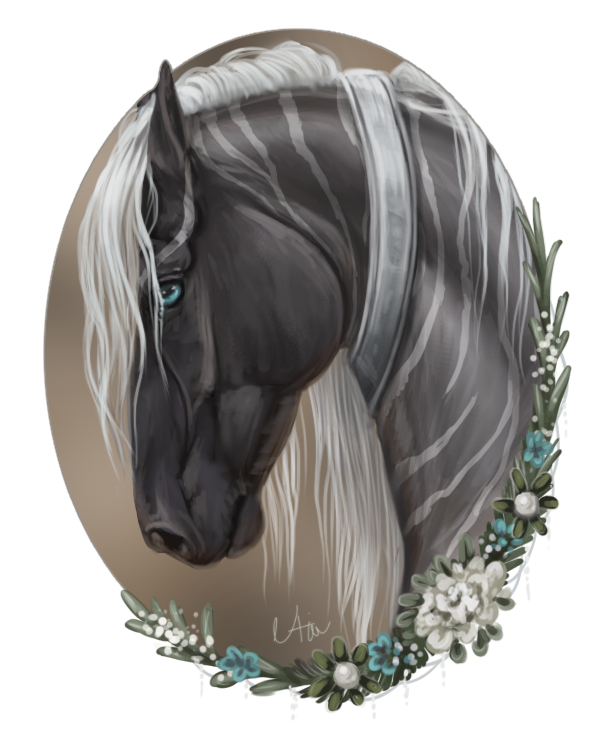 She remembers the slaughter the next morning – she remembers Viceroy bloodstained and dead, crushed beneath the weight of a swirling mass of hooves and bodies. She ran until she could run no longer, until her legs gave out, until she couldn’t breathe. She ran blind, with no direction. She ran. With nowhere to go and nothing to do, she wandered and waited for the Day Court to rise again – for purpose once more. DISCIPULI : Notably stronger than Novus’s natural telekinesis, though still far weaker than at later ranks, at the Discipuli level, Seraphina’s telekinesis allows her to lift any object she can carry naturally within a range of approximately twenty feet. She is only capable of lifting one object at once, and she is considerably lacking in finesse and accuracy. Her magical prowess varies wildly with her emotional state, and she tires remarkably quickly. VEXILLUM : At the second rank, Seraphina’s magic allows her to manipulate up to two objects that she can carry naturally at once. With objects of this size, her finesse and accuracy when wielding them is reasonable, though still not exacting, and easily faulted by distraction. She can lift a single large object of upwards of 300 pounds, but she cannot manipulate it with much accuracy or finesse, and she tires quickly when she attempts to lift extremely heavy objects. Her magic is still influenced by her emotional state, though it is not as volatile as in the Discipuli rank, and she can use it for longer periods of time without growing particularly tired. She is able to manipulate objects within a range of roughly 30 feet. PERITI : At this rank, Seraphina gains the capacity to manipulate up to two large objects at once. She can also lift objects that are relatively massive, of roughly 1000 pounds, though the distance within which she can move them and the speed at which she can throw them without draining herself extensively is limited. She is able to manipulate smaller objects with extreme precision, and she can manipulate several of them at once, though her accuracy decreases with more than two. It takes a considerable amount of magic use to drain Seraphina’s power at this level, and, although her emotional state still has some impact on her magical prowess, it tends to present itself with her Parvus magic, rather than her active magic. She can manipulate objects within a range of roughly 50 feet, though her accuracy and strength decreases with distance. DOMINUS : At the Dominus rank, Seraphina can manipulate any objects within her field of vision, though her accuracy decreases significantly with objects farther away, particularly if they are relatively small. She can manipulate extremely massive objects, such as entire buildings, though only for short periods of time, and, if she chooses to move them, the action is relatively slow and restrained. Depending on the size of the object, this can be extremely straining, so she tends to shy away from it. She can manipulate any number of objects that she can carry naturally with some degree of finesse; so long as she is manipulating less than three at once, her accuracy is undoubtable, but, once she adds in more, she becomes clumsier with each additional object. Larger objects of upwards of 300 pounds are limited to three, though she can control them with considerable accuracy, and upwards of 1000 pounds, but not extremely massive, are limited to 2 at a time, and her accuracy and strength decreases steadily with more than one. At this level, her emotional state only impacts her Parvus magic. While moving objects that are, say, the size of buildings any considerable distance will drain her strength rather quickly, she can manipulate smaller objects for almost unlimited amounts of time. 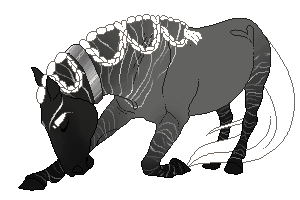 PARVUS : When experiencing strong emotions or utilizing her magic extensively, Seraphina’s flows out of her body freely, making it appear as though she is suspended in water; her hair falls out of its tight braids and billows and floats freely with her movements, and her hooves hover a few inches off the ground. At higher levels of magic (Periti and Dominus), small (less than a pound) objects that she passes might hover alongside her, drawn up by the strength of her leaking magic. On immediate examination, the bearded vulture that is often seen haunting Seraphina’s shadow like some cackling specter is not particularly unusual. She is large, for a bird, with a wingspan of approximately 10 feet, but light. Depending on the weather, the blanched white that coats most of her feathers can fade to a ruddy, bloody red. Her eyes are an eerie patchwork of black, red, and beady yellow. She has great hooks of talons and a sharp, sharp beak. She looks somewhat vile, certainly – but not unusual. Teeth, unnaturally long and sharper than sharpened knives, line the inside of her beak; there are several rows of them, as though she is a shark, and her gaping maw opens far too wide, almost like a serpent. Her talons might as well be cut of polished steel – they tear flesh as easily as paper. She is too quick, too agile, too graceful in the air for a bird that should circle and soar. She laughs, and she laughs, and she laughs – she laughs like she knows something, or she knows everything. And, in a voice that sounds so unnatural – low and rough and musical, too lovely for such a horrible thing – falling from the scythe curve of her beak, she speaks. It does not matter who you are or what you are; she will understand your words, and you will understand hers. I call on everyone, she might say, with a raucous laugh. Did you think that you would not know my voice? This is not to say that she is evil; evil is too simple a word. Ereshkigal is inevitable, unyielding, unforgiving – but she is not evil. That is not – was not - her job. She is no simple torturer, no brute sent to condemn passing souls; no, Ereshkigal is a judge of the dead, an arbiter of souls, and it is – was – her job, for many thousands of years, for countless eons (but time does not truly flow for the dead or in the realms of the dead), to decide their fate. Rather than evil, she is merciless in her objectivity, merciless in her intensity. Even tugged from her post in the realm of the dead, thrown into what she thinks – but can never be sure – is a new realm entirely, Ereshkigal is a judge first and foremost, and she cares for justice above all else. She does not flinch from horror, and she does not flinch from horrible things, but she advocates for them only when she believes that they are righteous. Ereshkigal is not sympathetic. She is impassive and unkind, and she cares very little, if anything, for mortal lives, but, while she lacks even the slightest inclination towards warmth (and can, in fact, be quite sadistic), she is not unfair. She greets the world with cold, concise confidence and certainty, a vicious smugness - all roads lead, eventually, to death. She will meet you at the end of them. COLLAR : Seraphina wears a tight silver collar around her throat most all the time - it was given to her by Viceroy, her mentor, though it was not a gift. Touching the collar outside of combat elicits a panicked reaction from Seraphina, regardless of how restrained and impassive she might generally appear. ALSHAMTUEUR: Though it may initially appear to be a simple sword, closer examination of the Alshamtueur - "sun slayer," in ancient Solterran - reveals something much more bizarre. Roughly three and a half feet long, faintly curved, and carved of Solterran steel, this ancient blade is ornate, and it seems to be several hundred years old, in spite of its pristine condition. A simple polish will cause the sword to bleed; it seems to have had many wielders, over the years, and cut many men down in battle. Though largely quite simple in design, the handle is quite lovely, with a pattern of suns carved around a single word, written in a largely-forgotten script. This is the sword's name, and, when it is spoken aloud by its wielder, the sword bursts into searing flames; speaking its name again will extinguish the flames. The Alshamtueur seems to "choose" its wielder, and it only ever has one at a time - only death can make it choose another. Even while at rest, it seems to radiate a faint heat, and it seems to buzz faintly, as though the sword is somehow alive. ARMOR : Though relatively understated, Seraphina's armor is well-equipped to handle the desert landscape she inhabits. A mesh of leather, thick, but light golden fabric, and Solterran steel, it is light, breathable, and quite easy to move in, protecting Seraphina's most vulnerable angles without inhibiting her movement. A slim, light steel arrow about a foot in length and sharpened at either end hangs loosely in a small snare on the left side of her breastplate, often obscured from view. When undercover, its long, billowing hood allows her to hide her scarred face, with the small crown of silver on her forehead the only indication of who she used to be. I'm 19, located in the USA, and a little out-of-practice at the moment.